The urachus is a remnant of a channel between the bladder and the umbilicus (belly button) where urine initially drains in the fetus during the 1st trimester of pregnancy. The channel of the urachus usually seals off and obliterates around the 12th week of gestation and all that is left is a small fibrous cord between the bladder and umbilicus called the median umbilical ligament. What are the disorders of the urachus and the symptoms? Disorders of the urachus occur when there are abnormalities with the sealing off of the channel during fetal development. 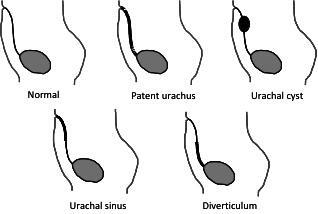 There are at least 4 types of urachal abnormalities seen (Figure 1). This occurs when a section of the urachus did not seal off, but there is not a connection between the bladder and umbilicus. Often, this is asymptomatic and is only detected when an ultrasound is performed for other reasons. Occasionally urachal cysts can become infected and could cause abdominal pain or could start to leak cloudy or bloody fluid at the umbilicus. The average age for urachal cysts to present with an infection is 2-4 years old. This occurs when the urachus did not seal off and there is a connection between the bladder and the umbilicus. A patent urachus can cause varying amounts of clear urine to leak at the umbilicus. This occurs when the urachus did not seal close to the umbilicus and leads to a blind ending tract from the umbilicus into the urachus called a sinus. These can be asymptomatic or present with infection with abdominal pain and drainage of fluid. This occurs when the urachus did not seal close to the bladder and leads to a blind ending tract from the bladder into the urachus called a diverticulum. These also can be asymptomatic or present with a urinary tract infection. How are the urachal disorders diagnosed? Urachal disorders are usually diagnosed when there are symptoms such as: drainage from the umbilicus, redness around umbilicus, abdominal pain, or urinary tract infection. An ultrasound can often detect urachal anomalies but occasionally other tests are needed. A sinogram or sinography is a test where contrast is injected into the umbilicus to see if there is a patent urachus or urachal sinus. Another test called a VCUG (see voiding cystourethrogram) is also occasionally performed if there is a urinary tract infection or to ensure that the bladder drains properly. Rarely tests such as a CT scan or MRI are needed for diagnosis. How are the urachal disorders treated? If the urachal disorder presents with an infection, the infection is treated first. This requires antibiotics, possible admission for intravenous antibiotics, and occasional surgical drainage of any infected cyst or poorly draining cavity. Once the infection is under control, excision of the urachus is usually performed. This can usually be done laparoscopically or with a small incision on the lower abdomen. Patients usually stay in the hospital 1-2 days after the surgery. The urachus can be excised because in normal development it usually obliterates anyway. The umbilicus is not removed. Why are the urachal disorders treated? The main reasons for why urachal abnormalities are treated are for symptoms such as drainage, irritation, or infection. After control of any infection and surgical removal of the urachal abnormality, your child can be expected to not have any more problems with the urachus. There is a small risk of localized infection (< 10%) after removal of the urachus, but this can usually be treated with just antibiotics.